I can’t believe that nobody on Flayrah has mentioned Curtis Jobling’s Wereworld Young Adult books yet. Although only the first has been published in America in hardcover so far, they are up to Book 3 in Britain in Puffin UK paperbacks, with Book 4 due in June, and the next two announced for January and June 2013. 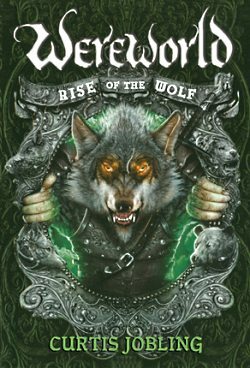 The British edition of Wereworld: Rise of the Wolf was published in January 2011. Werewolf novels have a spotty acceptance in Furry fandom, but the Wereworld series seems designed for us. Its shapeshifters are intelligent, not feral beasts, and live in the Seven Realms of Lyssia, each of which is ruled by a different Werelord: the Werefoxes, Wererats, and so on. The protagonist, sixteen-year-old Drew Ferran, is the last of the Werewolf dynasty of Lyssia, which has recently been “ethnically cleansed” of wolves by the Werelions led by tyrannical King Leopold. This is a well-told but stereotypical “teenage farmboy in a mythical kingdom learns that he is really a disguised prince and raises a revolution to regain his throne from the cruel usurper who murdered his parents” adventure, with plenty of shapeshifting. Two of Drew’s first allies are the Wereboar Lord Hector and the Werefox Princess Gretchen. NYC, The Penguin Group/Viking, September 2011, hardcover $16.99 ([ix +] 412 [+ 7] pages), Kindle $10.99. Map by the author. Rise of the Wolf begins with Drew Ferran as a teen farmboy near the English-sounding market village of Tuckborough in Westland, one of the Seven Realms of a Medievalish world. Times are hard with King Leopold the Lion on the throne, but Drew is content. But something is happening to Drew lately. The farm animals that have always been placid in his presence have suddenly become nervous, almost afraid of him. On a day when his father and brother are away at the local town, Drew himself gets mysteriously sick. The description goes on for two more pages. I am quoting it at length to show Jobling’s skill at creating a scene and describing action in depth. While Drew is too sick to intervene, the monster (which can talk) attacks his mother. This is only the beginning of a lengthy and graphic transformation scene. Before the monster could move Drew instinctively leapt forward. He cleared the distance between them in one bound, crashing into the beast’s chest, and the two tumbled to the floor in a ball of flailing claw, tooth, and fur. Drew is too late to keep his mother from being killed, and their fight demolishes the farmhouse. When his father and brother return, the farmhouse is rubble and their mother is bloodily torn apart. Even though Drew is human again, his father immediately blames him and tries to kill him, forcing Drew to flee into the nearby Dyrewood. Drew spends several months hiding in the Dyrewood, transforming into a beast to hunt to survive. Eventually, Drew comes to meet Duke Bergan, the Bearlord ruler of Brackenholme; and he is suddenly thrust into the deadly politics of the shapeshifting Werelords of Lyssia. Bergan is a friend; Vankaskan, the Ratlord, is an enemy; Hector, the young son of the Boarlord Baron of Redmire, is another friend. Drew learns that his true father was Wergar the Wolf, the previous King of Lyssia who was betrayed and murdered by Leopold the Lion. Princess Gretchen, the spoiled teen werefox, provides the prickly romantic interest in this Young Adult novel. Furry fans will enjoy the complex sociopolitical infighting among the Werelords as Leopold’s allies hunt to kill or capture Drew, while Leopold’s enemies rally around Drew, some to support him as the rightful king, others to use him as a figurehead for their own ambitions. Readers will need to refer to the map of Lyssia often. Drew, who is understandably confused by all of this (which escalates into an outright Lyssian civil war in the sequels), not to mention being able to turn into an almost-invulnerable wolf (how many wolves besides him survive? 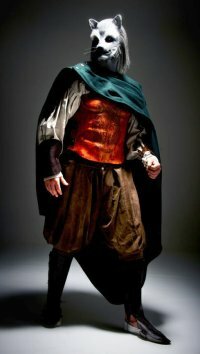 ), struggles to become a real leader and protector of the common people of Lyssia, therianthropes or not. Wereworld is Curtis Jobling’s first book series for older readers (he has written & illustrated many British children’s picture books), but he is no stranger to adult fantasy. He worked on Tim Burton’s Mars Attacks! theatrical feature and on several early Aardman Animations stop-motion films. In 1997 Jobling began to create award-winning children’s TV series for BBC TV, including Bob the Builder (Ed: "Can we fix it? "), Frankenstein’s Cat, and Raa Raa for preschoolers. 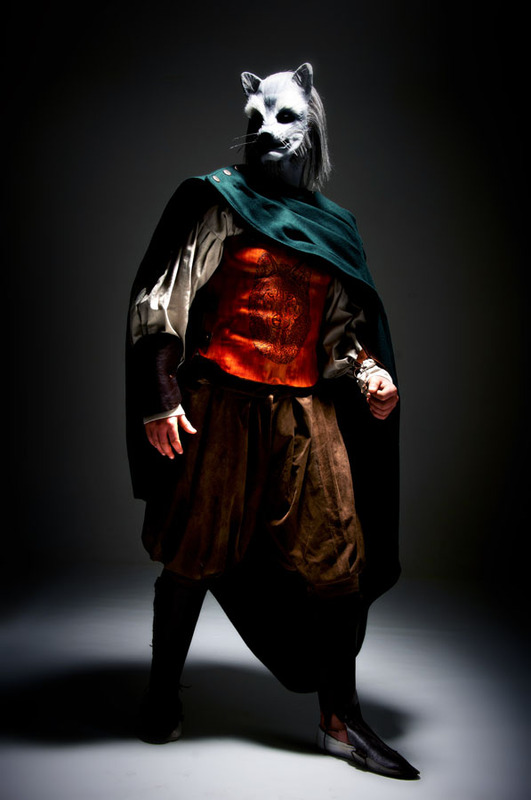 With Wereworld, Jobling returns to producing dramatic fantasy for older audiences. He has always been a fine artist, exhibiting his paintings and prints in international art galleries. Hi Fred - can't tell if it was enjoyed or not by the 2 stars. I don't think TWILIGHT's success has helped much with WEREWORLD's fortunes - you're right that folk do assume it's bandwagoning as werewolves are 'en vogue' again after those books, but I probably started writing RISE in 2006, a year before Meyer's first novel was released, so was utterly unaware of upcoming mega-success of that book. Anyhoo's, hope you stay with the series. Things get ramped up quite dramatically as the story progresses (and while RISE showed me learning the ropes of novel-writing I'm beginning to break into my stride with RAGE OF LIONS). Currently plotting the fifth novel in the series and shall be kicking off writing this coming week. Cheers for the feedback guys! Hi Curtis! Thanks for taking the time to drop by and give us some more background on Wereworld. For what it's worth, the star rating is Flayrah's users' rating of this review, not the reviewer's rating of your work. No problem at all, I get alerts now and again via the magic of Google so I winged my way over to see what was what ;-) I sussed the rating system after I posted. Great site - and Flayrah is for "Furry Fandom"? A world is opening up to me! I'm a huge fan of anthropomorphosised animals, let alone werecreatures, so I shall ensure I call in more frequently. On that subject, my latest preschool animated series is that very thing, Raa Raa the Noisy Lion, set in the Jingly Jangly Jungle... you can probably fill in the rest. Those Alerts are great, aren't they? Flayrah's in Google News, so they usually trigger on our posts. If the fandom is new to you, you can find out more at Wikipedia; and at WikiFur (intro to furry). To keep up with Flayrah, you can follow us on Twitter - or our RSS, LJ or Facebook feeds. Whatever's convenient! "Raa Raa" sounds like a very good series for Furry parents to introduce their preschoolers to. Um, I haven't checked yet to see if it is on the air in the U.S.A./Canada. Yes, I did enjoy "Rise of the Wolf" very much, and I hope that I can get Viking to send me a review copy of "Rage of Lions" so I don't have to wait for the L. A. Public Library to get it to read it. I am into Middle Earth-type fantasies with detailed political action. We're still waiting on a US broadcaster, although we have the magic number of requisite episodes in the can (52) which means it's ready for pick up. Hopefully it's a case of when rather than if. Do please pester Viking for that review copy of RAGE, Fred - I'll be over in the US next month appearing at Book Expo America (BEA) in NYC. Sounds like you and I are fond of similar books, chum. You can see a lot of the recent books that I've read here at Flayrah. Others more animation-related are at http://www.awn.com/category/columns/fred-pattens-book-reviews Since many of these anthro novels are by anthro small presses that are not well-publicized, you may find a trove worth reading here.